After this recession, will we ever be “back to normal?” More importantly, do we want to be? Since the difficult days of December 2007, when the recession technically began, a lot has changed. As a nation, we lost millions of jobs, millions in investments, and maybe more importantly, we lost a sense of confidence. However, when we look through a more optimistic set of lenses, you can begin to see that there are positive aspects of every negative scenario, especially for entrepreneurs. Let’s take a look at the average small businesses. This recession has provided true challenges to startups and small companies. They were forced to learn skills and lessons that they were never required to learn in the past. Even though many companies and organizations were forced to downsize a portion of their workforce, they learned to provide their products/services to customers in a leaner manner. Every action was preceded with, “Am I being cost-effective?” Yes, sales were down. However, companies were forced to look at their expenses, waste, and management strategies as a result of the recession. Every customer became more important, and therefore, more valuable. Providing more value was no longer an option, but a necessity. By doing things like eliminating waste, companies create more efficient and profitable business models. I know you are probably saying, “Why can’t companies do these things all the time?” The truth is that they can, they just don’t. In good times, companies spend, spend and spend, just as consumers do. When times are tough, individuals and institutions have to look closer at efficiency, productivity, and the bottom line. These lessons will outlast the recession and will allow companies to use “recessionary management” during profitable times. Furthermore, the recession allowed us to view tough times as an opportunity. When millions of people were being down-sized and let go, I thought to myself, “there are a tremendous amount of talented individuals that are looking for work, and they are probably willing to accept a lower salary.” This proved to be very true. Many startups were able to acquire talented workers to join their team during the recession, when normally these same workers may be skeptical to join such an unestablished company. 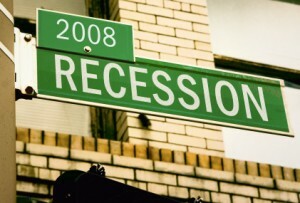 Yes, the recession hurt America and our current way of life. However, it also spawned a new level of innovation and a new sense of efficiency and value. What we thought was “enough” value for our customers proved to be not enough. As sales dropped, we were forced to change our strategy, become more efficient, and work harder. In that light, the recession proved to be a blessing in disguise. Maybe I am being a little too optimistic, but I don’t think so. What do you think? Join the discussion in the comment section below.